Carol June Shapiro (Junie), 84, passed away peacefully on November 30, 2018, in Odessa, MO. She was born on March 29, 1934, in Noel, MO, the fifth child of Walt and Edith Shingleton. Carol lived in Kansas City for more than sixty years, and retired from First Federal Bank, Kansas City. She was a long-time volunteer for the YMCA Indian Guides, and she held a Black Belt in Judo. 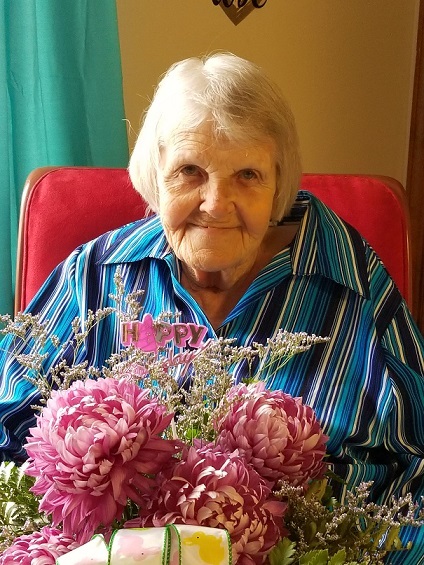 She enjoyed family gatherings, swimming, and was a green-thumb gardener. Her yard was the envy of the neighborhood. Carol is survived by her grandchildren, Kasey King and Damon Shapiro, and two great grandchildren; two sisters, Mary Meek and Sandra Barrett, and many loving nieces and nephews. She is predeceased by her parents, her husband, Maurice, and her son, Mark; her brother William Shingleton, and four sisters Betty Wylie, Dorothy Griffith, Marlene McLaughlin, and Sara Payne. Carol was of strong character and, together with her wit, it shone through, even until the end. The family wishes to thank the staffs of New Haven in Odessa and Crossroads Hospice for their sensitive care. In accordance with Carol’s wishes, there will be no services and she has been cremated. Park Lawn Funeral Chapel in Kansas City, Mo has been entrusted with the arrangements. In accordance with Carol’s wishes, there will be no services and she has been cremated. All of your family LOVED you so much. My Mom always looked forward to working with you on Facebook to build your farms. Thank you for being so strong all of your life. I will never forget and will always be honored to have been able to help just a little at the end. Sandy will miss you so much. She was the real trouper when you needed it. We will talk about we I see you again as you and I believed. LOVE and memories always.